New York Gov. Andrew Cuomo signs legislation designed to increase the statewide minimum wage to $15. New York’s new law increasing the hourly minimum wage to $15 by the end of 2021 in much of the state will result in job loss, facility closures and resident moves to more costly nursing homes, the Empire State Association of Assisted Living predicts. New York Gov. Andrew M. Cuomo signed the legislation, as well as a 12-week paid family leave policy said to be the most comprehensive in the country, April 4 as part of the 2016–17 state budget. “These policies will not only lift up the current generation of low-wage workers and their families, but ensure fairness for future generations and enable them to climb the ladder of opportunity,” he said. Businesses with at least 11 employees will be required to pay a minimum of $11 per hour by the end of this year, then another $2 each year after that until paying $15 an hour by Dec. 31, 2018. For smaller businesses, a minimum wage of $10.50 will be instituted by the end of this year. It will increase another $1.50 each year afterward until reaching $15 on Dec. 31, 2019. For businesses in Nassau, Suffolk and Westchester counties, the required hourly minimum wage will increase to $10 at the end of this year, then $1 each year afterward until reaching $15 on Dec. 31, 2021. For businesses in the rest of the state, the minimum wage will increase to $9.70 at the end of this year, then will increase another 70 cents each year after until reaching $12.50 on Dec. 31, 2020. After that time, it will continue to increase to $15 on an indexed schedule to be set by the state budget division director in consultation with the Department of Labor. Also, beginning in 2019, the state budget division director every year will analyze the economy in each region, as well as the effect of the minimum wage increases statewide, to determine whether a temporary suspension of the scheduled increases is needed. The 12-week paid family leave policy, funded through an employee payroll deduction, will be phased in beginning in 2018 at 50% of an employee’s average weekly wage, capped to 50% of the statewide average weekly wage, and fully implemented in 2021 at 67% of an employee’s average weekly wage, capped to 67% of the statewide average weekly wage. As much as the new minimum wage legislation will affect senior living providers, the effect could have been worse, LeadingAge New York President and CEO James W. Clyne Jr. told McKnight’s Senior Living. Under the legislature’s original proposal, he said, costs for nursing homes would have increased $600 million, and the increased cost for home care and personal care providers would have been $1.72 billion, the organization had estimated. The provision to implement the wage increase more slowly in upstate New York will lower those cost estimates, Clyne said. The organization also supports the provision to temporarily suspend increases, as needed, after 2019, he said. 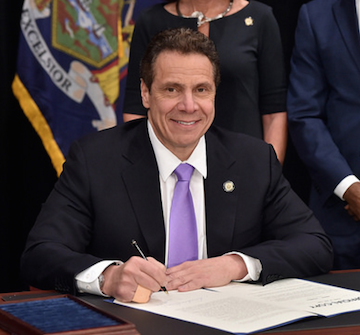 Cuomo signed New York’s legislation the same day that California Gov. Jerry Brown signed into law a plan to ultimately increase the hourly minimum wage to $15 in that state.